Canada is publishing Employment Change and Unemployment Rate along with the US publishing Non Farm Payrolls and Unemployment Rate which all of these reports are extremely influential for USDCAD. 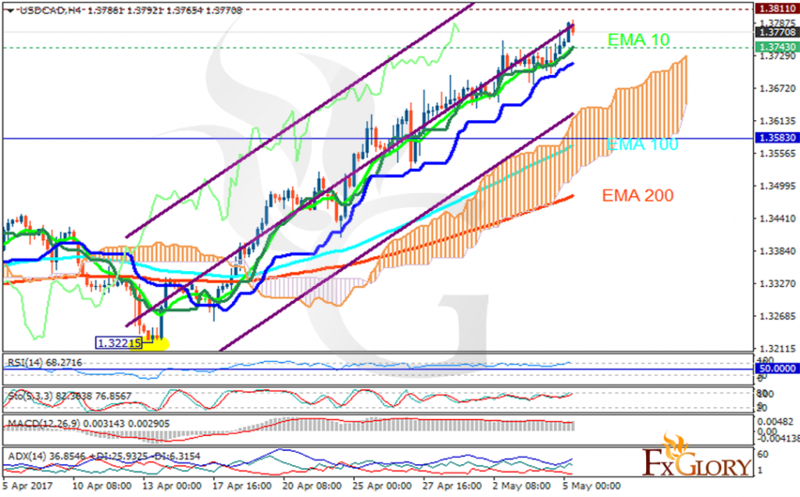 The pair is finding support at 1.37430 with resistance at 1.38110 which both lines are above the weekly pivot point at 1.35830. The EMA of 10 is moving with bullish bias along the ascendant channel and it is located above the EMA of 100 and below the EMA of 200. The RSI is moving in the overbought area, the MACD indicator is in positive territory and the Stochastic is moving in high ranges. The ADX is showing buy signals. The price is above the Ichimoku Cloud and the Chinkou Span. The Tenkan-sen and the Kijun-sen are both showing an upward trend. Long positions are recommended targeting 1.3820.